It was planting time for carinata even as the fall and early winter was declared the wettest year on record in the United States. SPARC states averaged anywhere between 14 and 17 inches of rain, in the month of December alone, based on personal communications. Needless to say, planting was challenging; however, it’s now complete. Agrisoma was successful in recruiting new and repeat growers for the 2018-19 season. Some of the commercial acres we visited earlier this month looked great, and were being farmed using best practices for sustainable yield maximization and risk reduction. Meanwhile our supply chain team has made headway in developing multiple scenarios for use with the Freight & Fuel Transportation Optimization Tool (FTOT). Among several outputs, these analyses will represent current and future candidate locations for infrastructure development. These tools and analyses will help inform stakeholders of the opportunities and gaps in order to develop a carinata supply chain in the Southeast US. A good example of the effect of SPARC’s stakeholder education and outreach comes in the way of an opportunity to put together a biofuels distribution study for the state of Alabama, a SPARC member state. Continue to educate, inform, listen, and investigate regardless of where you are or what your role in SPARC may be. Carinata’s success, and therefore, SPARC’s success, will depend on it. Looking forward to seeing everyone at the 6th Carinata Biomaterials Summit and the 2nd SPARC Annual Meeting! SPARC aims to develop a body of knowledge and practices that will support the sustainable expansion of carinata feedstock supply in the SE US using high grain and oil yielding carinata genotypes, best management practices (BMPs) and risk management tools. In the first year of SPARC, 52 field and controlled environment studies were planted on > 40 acres in FL, GA, AL, MS, SC, and NC. Frost tolerant high yield entries were identified across several testing sites, nutrient deficiency symptomology was documented, multiple lines with high tolerance to the herbicide dicamba were identified, effective harvest aids were identified, and a commercial scouting protocol was developed. SPARC continues to identify genotypes with yield-stable genetics, develop complementary agronomics, and strategies to manage field variability for consistent high production. We need to continue screening new breeding materials for biotic and abiotic stress tolerance to identify high yield genetics with important traits such as cold tolerance, early maturity, disease tolerance, and desirable fatty acid composition. This may require testing in regions with diverse and extreme ecoedaphic profiles for some traits of interest. Mike Mulvaney, University of Florida (UF) cropping systems agronomist, stated that “stable genotypes that are able to tolerate different soil types, freeze conditions, short periods of waterlogging and drought are key to high performance under our environmental conditions”. Perhaps different carinata varieties that will perform efficiently at various latitudes across the SE would be one way to stay ahead of the uncertainty presented by spatial and temporal variability in our environment from year to year. David Wright, UF row crop agronomist stated that “a healthy vigorous stand during the early stages of development is critical to achieving high yields”. Nurse crops (a winter crop planted along with carinata) may reduce soil erosion, break soil crust enhancing carinata germination and emergence and provide protection in the event of subfreezing temperatures during the early stages of carinata growth. The utility of nurse crops in carinata establishment is currently being tested as a SPARC objective. Variability in soil physical and chemical properties may call for differential management in terms of field preparation, planting, and in-season management. Creating zones based on similarities in soil properties may aid in prescriptive management leading to conservation of resources and consistent yields. Precision agronomics is the use of a combination of field zoning, variable rate technologies, , various computer-based applications, and remote sensing technology. An opportunity to test the effectiveness of precision agronomics in carinata production presents itself for SPARC, given the increasing prevalence of use of such techniques in broader commercial production. 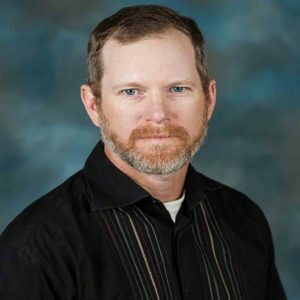 D r. William Anderson is a research geneticist at the USDA-ARS at Tifton, GA working on warm season forage and biofuel feedstock breeding and production. Prior to that he has been a peanut and cotton breeder at both private and public institutions. Dr. Anderson has an impressive track record in biofuel research for more than 15 years and collaborates with public institutions and private companies to facilitate establishment of a biofuel industry in the southeastern United States. He was named coordinator of the USDA southern regional biomass center that covers 12 states and Puerto Rico. In his role as the coordinator he has assisted the office of national programs of USDA-ARS and industry partners in developing action plans to reach mandates for advanced biofuel production under the renewable fuel standard RFS2. He is also the ARS representative on the interagency committee of the Farm-to-Fly initiative. He was a key participant of the Feedstock Readiness Level tool (FSRL) evaluation and tracking subteam. He has been a member of the UGA bioenergy systems research institute for over 5 years, Vice Leader and Leader of the bioenergy systems community of the Agronomy Society of America. 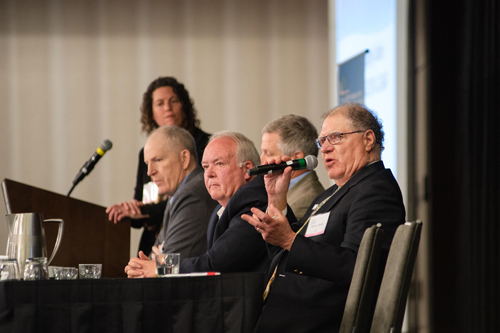 Dr. Anderson’s involvement in the bioenergy space extends beyond research to engaging with stakeholders including private industry, policy making agencies, extension agents, crop producers, and so on. He has been a presenter and moderator for the annual Southeast Bioenergy Conference for over 7 years. This conference has educated an average of 400 attendees each year including private business owners. Similarly he has shared his research findings on bioenergy feedstock to several audiences at field days, expos, public demonstrations etc. He has led the initiative to foster collaborative research among ARS locations, universities and private industry interested in accelerating the development of dedicated feedstock for renewable energy production. In SPARC, Bill plays an integral role in the feedstock development team bringing his decades of research experience in bioenergy to the group. Given his track record in the biofuels space he is considered one of the leading experts on feedstock supply of renewable fuels and chemicals in the Southeast. Dr. Mike Mulvaney is the Cropping Systems Specialist at the University of Florida, located at the West Florida Research and Education Center in Jay, FL. He works extensively in all row crops including peanuts, corn, cotton, soybean, wheat and of course, carinata. Through his research he remains committed to reducing on-farm expenses while improving nutrient use efficiency of cropping systems for enhancing environmental quality. Dr. Mulvaney has tremendous international experience having traveled to over 50 countries on six continents. These experiences include a stint at CIMMYT in Mexico where he worked as a cropping systems agronomist. He has served as the Asst. Program Director for USAID’s SANREM innovation lab which is the Feed the Future Innovation lab for collaborative research on sustainable agriculture and natural resource management. In SPARC, Dr. Mulvaney is part of several sub-teams under the feedstock development team. 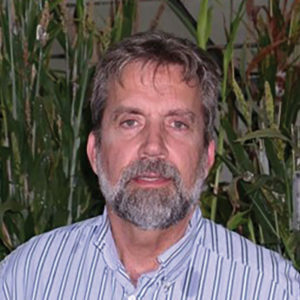 Specifically, he is the lead of the nutrient management sub-team in which capacity he and his team members are generating useful data related to carinata’s nutrient requirements, improving carinata nutrient use efficiency to help meet environmental and regulatory sustainability standards for a viable biofuel industry without compromising crop yield and farmer profitability. In his extension role he provides evidence-based information to extension agents and growers, agricultural professionals and policymakers to inform their decisions related to crop management. He helps validate and improve several crop management related decision making tools to then demonstrate to stakeholders with the goal of increased adoption of sustainable crop management practices. He is engaged in several services to the scientific community, some of which include serving on the board of directors for the American Society of Agronomy, Associate Editor of Agronomy Journal and Crop Science. Dr. Mulvaney has served in Peace Corps Bolivia and the US Army National Guard. His passions include cycling, running, participating in triathlons, wine-making, and international travel. He also claims to be a “poor” flute player….we may have to be the judge of that one of these days. 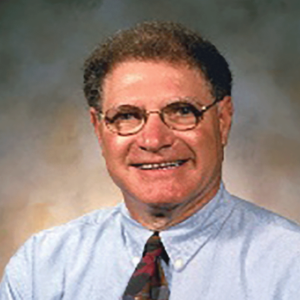 Rich Altman is a co-founder and Executive Director Emeritus of the Commercial Alternative Aviation Fuels Initiative (CAAFI). His exemplary aviation career consisted mainly of a long stint at Pratt & Whitney primarily in advanced technology business development. He is the founding member of the US Transportation Research Board Committee on aviation effects on the environment and a member of the PARTNER center of excellence advisory board. Rich’s focus has been on sustainable aviation jet fuel and high value co-product supply chain development especially on the US east coast. Rich has facilitated the development of regional teams from Vermont to South Florida to generate support from USDA programs for dairy based renewables in Vermont, municipal solid waste renewables in Connecticut, Wood based renewables in South Carolina, and multiple feedstock in Florida that could help mitigate citrus related losses. Rich was invited to lead the supply chain team in SPARC. He came to SPARC with a vision not only to integrate it with his other ongoing east coast initiatives but also to help lift off a carinata based bioeconomy in the Southeast. He is trying to realize this vision through his unwavering commitment to sustainability, systematic engagement with stakeholders along the entire supply chain and an unstoppable passion for holistic regional development through job creation and enhanced economic vitality. During his leadership at CAAFI it was awarded the Air Transport World Joseph Murphy Innovation Award and the Washington Airports Task Force Williams Trophy for “Improving the Quality of Life on Earth”. Rich is a fearless visionary, helping to paint the big picture for any new venture and then mobilizing resources to bring it to realization. He is truly a valuable asset to SPARC. Rich is a New Yorker and not surprisingly, an ardent Mets and Jets fan. He and his wife have two sons pursuing successful careers of their own. He enjoys spending time with their Australian shepherd and mini Aussiedoodle, golfing and playing pickle ball, but remains modest about his skills in these sport. In SPARC he is focusing on the extraction of sinapic acid from carinata meal and the synthesis of high glass transition temperature polymers from sinapic acid. Steven enjoys learning magic tricks, a skill that he recently picked up. Though still a beginner magician, he hopes to perform for his family or friends. He aspires to join the private sector after attaining his PhD. She has been actively involved in training farmers and students. Leelawatie added to her skill sets by undergoing several trainings including one on soil and water conservation at the Instituto Mexicano de Tecnologia del Agua in Mexico, a workshop on integrated disease management of Black Sigatoka in banana and plantain, and a training on management of water resources and adaptation of family farming to climate change at the Inter-American Institute for Cooperation on Agriculture. While in Guyana she was actively engaged in 4-H activities including serving on its steering committee to help restore that program in schools there. 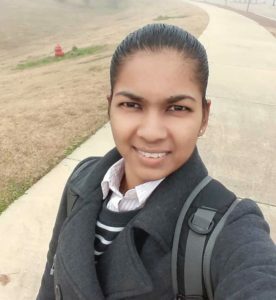 In SPARC she is looking at temperature effects on carinata growth and development and agronomy of carinata production in Mississippi. She is being co-advised on this very significant work by Dr. Raja Reddy also at Mississippi State. Leelawatie grew up in a farming household in Guyana, and attributes her love for agricultural science to her upbringing. She loves being with and helping people, enjoys the outdoors and loves to cook. Rich Altman Jessica Baldwin is a graduate student at University of Florida’s West Florida Research & Education Center at Jay, FL. She is pursuing a degree in Entomology with Dr. Silvana Moraes. Jessica graduated with a BS degree in natural resource conservation also from the University of Florida. In SPARC she is investigating the impact of defoliation due to insect pests on carinata at its different growth stages. 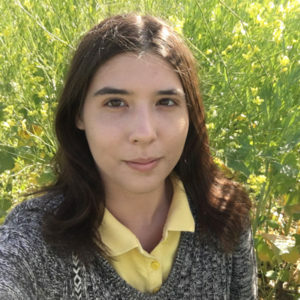 She has designed feding studies under controlled conditions to see if carinata is a suitable host crop for insect herbivores such as Microtheca ochroloma, Helicoverpa zea, Plutella xylostella, and Trichoplusia ni. Jessica is from Molino, near Pensacola, Florida. Her love for insect collection may have played a part in her decision to pursue an entomology degree. Jessica enjoys dancing and painting miniatures. She hopes to take up teaching after she graduates. 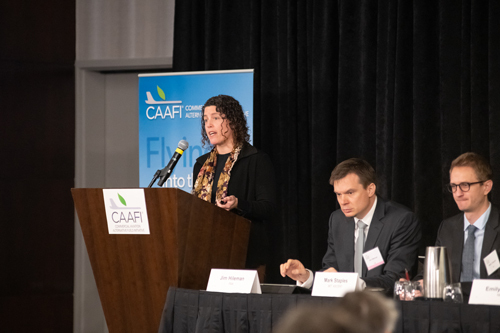 Presentations featuring SPARC and carinata at the CAAFI Biennial General Meeting held in Washington DC from December 4-6, 2018. 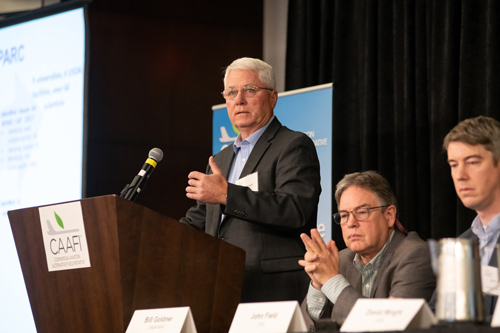 March 5-6, 2019 – 6th Carinata Biomaterials Summit will be held in Quincy, FL. For details go to www.sparc-cap.org. March 6-2019 – 2nd SPARC Graduate Student Oral Competition will be held in Quincy, FL. March 6-7, 2019 – SPARC 2nd Annual meeting will be held in Quincy, FL. March 18-20, 2019 – Dr. Dan Geller will attend the 12th International Biomass Conference and Expo to be held in Savannah, GA.
Sustainability Summit and National Extension Energy Summit to be held in Tampa, FL. SPARC graduate student talks and posters will also feature at this conference. 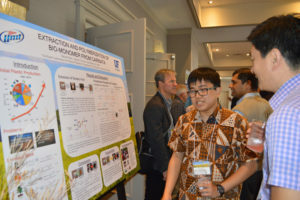 May 27-30, 2019 – An abstract submitted to the European Biomass Conference & Exhibition by Drs. Dan Geller and George Philippidis was accepted. Dr. Philippidis will deliver the talk at the meeting which will be held in Lisbon, Portugal.